Review: A boy lost in adolescence – trying to figure out his own identity. A girl confident in her own being – yet alone in society. 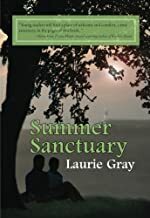 Two surprisingly familiar, yet unique characters find friendship and themselves in Summer Sanctuary by Laurie Gray. Matthew is the eldest child in a growing family with four boys and another baby on the way. He is preacher’s kid – which has its own challenges, plus he struggles with the fact that his next youngest brother is taller, faster, and better at sports than he is. While his brother is “Mark the superstar”, Matthew is just Matthew. His best friend, Kyle, is away for the summer, so Matthew is left with the library and his summer independent project for fun. He plans for a boring summer! But, little does he know, Dinah, a girl from a completely different world, will turn a boring summer into the adventure of a lifetime. Dinah is a teenager who is hiding from welfare services and living on the streets until she is able to be reunited with her mother. She knows that if she is put into foster care, her mother might never be able to see her again. She is street-wise and confident, but finds Matthew is the perfect cure for loneliness. Two unlikely teens find themselves in a secret friendship that changes both their lives forever. And I find that I’m all by myself. But neither is anyone else. With every poem, I found myself stopping and thinking . . . just what good poetry should do. In the end, Summer Sanctuary is an excellent book from first-time novelist Laurie Gray. Hopefully Gray will continue writing and providing quality literature for adolescents with wholesome themes. Parents should be very pleased to find their teen reading Summer Sanctuary. We would like to thank MM Book Publicity for providing a copy of Summer Sanctuary for this review. Have you read Summer Sanctuary? How would you rate it?